Millions of Americans remember well the power outages that occurred in the summer of 2012. They quickly found out how difficult life can be without lights, refrigeration, or a way to cook food. 1. Fuel efficient. If your power is out and you’re looking for fuel for your camp stove or fire pit, you can bet all the neighbors are, too! It’s important that an emergency stove heats up quickly and uses as little fuel as possible, since many disasters inherently bring with them a shortage of fuel. 2. Portable. You never know when you’ll need to grab an emergency kit and head out the door in an evacuation. If your camp stove is too bulky and carrying the fuel is a pain in the neck, you need to find another alternative. 3. Multi-fuel: If a stove burns only charcoal or only propane, it severely limits its versatility in a real crisis. Even wood-burning stoves may not be optimal unless you have a ready supply of seasoned firewood. Propane and butane are fine for the occasional camping trip, but significant emergencies often see these fuels disappear from store shelves. Ideally, your alternative methods should require fuel that is easy to find just about anywhere and is free. 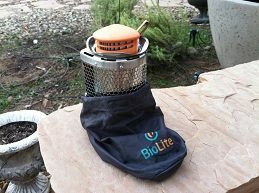 This brings me to the BioLite CampStove, which my family and I recently tested and used. It’s a very attractive option that will work for many people, from city dwellers to suburbanites to homesteaders. As we set it up and started the fire, it occurred to me that it would be the perfect stove for apartment or condo dwellers who have only a balcony or small patio. It’s compact and even when its fan is activated, it doesn’t attract a lot of attention. The BioLite is quite small and weighs just barely over 2 pounds. 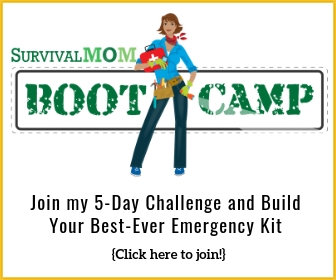 It would be super easy to keep it packed in a Bug Out Bag or other emergency kit. Because it’s highly fuel efficient, a shoebox filled with tinder, kindling, and twigs would be enough to cook several meals. Add one or two methods for starting the fire, and you’re good to go. 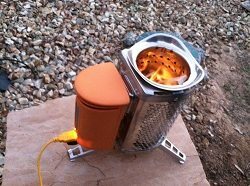 This stove comes in two parts: a Power Module and a stainless steel fuel chamber. The Power Module contains a rechargeable battery, which must be charged before using the stove. Once it’s charged using a USB cord (included) and as long as you use the stove at least once every 6 months, you won’t need to charge it again. Why a battery? It operates a small fan in the Power Module that creates an airflow that, in turn, creates a highly efficient fire. You’ll use less fuel than with other biomass-burning stoves and the stove design includes a USB outlet that is capable of charging small electronics. Although this stove isn’t technically multi-fuel, it still meets that requirement because it can burn just about any biomass available from dry twigs to pine needles and pine cones to finger-thick sticks. Dry moss, tree bark, wood shavings would all make fine tinder and are usually easily available. If not, homemade tinder such as Vaseline-infused cotton balls would work as well. We experienced this fuel versatility when my family gathered together to try the BioLite for the first time. We had recently pruned back some bushes and the kids gathered handfuls of small twigs and larger sticks. My son ran into the laundry room and brought out a handful of lint, which we used for tinder in the fuel chamber. As soon as the kids had a bit of a fire going, we pressed a button on the orange Power Module to turn on the fan. Immediately, the fire began to burn brighter and we were able to add additional sticks to the fire. After just a couple of minutes, we turned the fan on to its High setting, and the fire just took off! It actually created a fire whirlwind, which was pretty impressive to watch. I wanted to test its’ ability to boil water, so I placed an old coffee pot filled with about 5 cups of water on top of the fuel chamber. 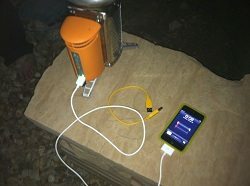 I forgot to continue adding fuel to the fire (we were busy testing the USB charger with various cell phones), but I can attest that the water heated quickly and would have been ready to make hot chocolate or a freeze dried meal in about 5 or 6 minutes with additional fuel. The BioLite comes with a limited 1-year warranty but is sturdy enough to last for many years. I liked the fact that it arrived with its own pouch, which protects it from damage and would protect our gear from particles of burned material still left in the stove’s fuel chamber. 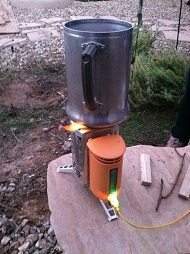 I recommend this stove for preppers because it meets my 3 criteria. It’s fuel efficient, portable (very), and uses a wide variety of biomass materials, which are typically easy to find. Outside of a complete collapse of our power grid, having a way to communicate and charge cell phones and walkie talkies (chargeable with a USB cord) is vital. Even light sources, such as rechargeable LED flashlights and headlamps can be charged. My husband’s iPhone and son’s iTouch charged just fine. My Android wasn’t charging, but that could have been due to the cord we used. Priced at $129, this isn’t a cheap option but it effectively combines the most important features of a versatile, efficient stove, useful for camping trips as well as emergencies. Watch this video for more instructions on its set up and use. P.S. The BioLite website states that the beautiful stainless steel fuel chamber can be washed in a dishwasher! Ooh! I like that! I did not receive payment for this review but was furnished with a BioLite CampStove in order to write the review. I do not promise positive reviews, just honest ones. Skill of the Month: Electricity-free for 48 Hours! Sounds pretty good, but I don’t like being held hostage to battery power, look at the kelly kettle, it does the same thing but requires no batteries works good with the attachments! I just got mine yesterday and have yet to try it out. The fact that it charges up as you cook is great. This is my second volcano stove. One for the car and now one for my family BOB. I may get a third to have on hand to share if needed. Have you used this to charge an ipod like in the picture? If so, did it work. 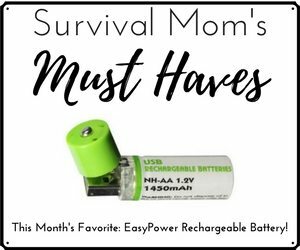 I was disapointed earlier this year when I took a hand crank usb charger camping and set the kids to charging the ipod only to get a response that it was not compatable. That’s pricey. Handy, but pricey. It gets harder to convince people to prepare when they have to lay out 130 bones for a little stove like this. I see its merit, but most people would spend the same money on a nice camp stove and 20 bottles of propane. I agree. 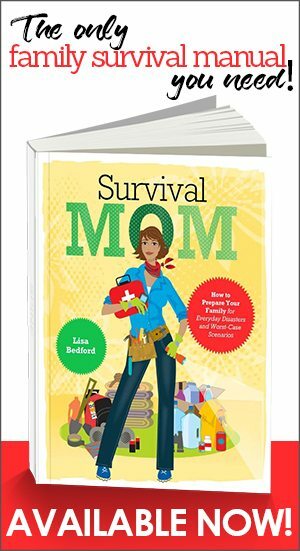 A lot of preparedness and survival is making judgements as to where to spend your dollars. For example, a homemade solar cooker may be almost free to make, but will it heat up sufficiently and cook food within a reasonable amount of time or would it be better to buy a Sun Oven, or some other commercially made stove, and save money elsewhere? When you decide to go cheap, you give up other features, some of which may end up being of more value than the money saved, e.g. convenience, time. Just food for thought! Thanks for the great review! I ordered one and it should arrive next week. Lisa, being a Mom and having at least two kids and a husband, can you tell me how easy it would be to make a family meal on this? Can you put a good sized pot on it? Some backpack stoves just don’t cut it for my family. I can only make two servings at the most. I need this bio lite to make four servings in a pot. Do you think it will stand up to that? I just realized that you posted about boiling water..5 cups I think you said. I guess I could pour the 5 cups into a bowl of freeze dried whatever huh? Did you feel like the top was sturdy enough for a big coffee pot? How does it do in high winds? I currently use a Kelly Kettle and Dutch oven, I am still on the lookout for another source for cooking. Thanks for all you do! I tried my new Biolite this morning. It is great! I used the fuel sticks that came with it as the wood/ etc. was still wet from the recent storm. I was able to boil a tea kettle very quickly. I used the hot water to make some instant oatmeal and cocoa for the kids. My only complaint is that it is a bit top heavy with the kettle of water on top and I worried the wind would topple it. On its own it is quite steady, but I am going to look for a smaller kettle. I also checked that the charger worked for my iPhone and iPod. Did not work for my iPad, but it is an older model. 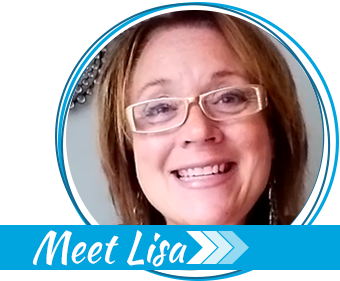 Great product and a great review, Lisa! Wonderful! I’m so glad you like the product, Marlene. You may want to post your question about charging your iPad on the BioLite website and get an answer directly from them. I live in an apartment are there any camp stoves that are safe to use indoors? There are several options for you, Sara, just be very, very careful to use them near a vented window and install a carbon monoxide detector in your apartment, just in case. Also have a fire extinguisher handy. In big enough emergencies, the fire department isn’t able to be everywhere at once. You can safely use butane stoves, chafing dishes (like caterers use), Sterno stoves, and denatured alcohol stoves. Propane might be okay if you have enough ventilation, but gasoline and wood-burning stoves are a huge no-no for indoor cooking.